Greetings friends of Billy's Belly and all you music lovers out there! It’s time once again to feel that rumble, August 18 as the thunder returns to Anson Valley! 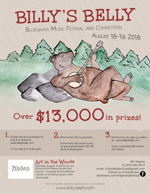 On Saturday starting at 10am there will be an "Art In The Woods" fair sponsored by the Wesserunsett Arts Council that will feature vendors, demonstrations, and a competition with prizes for best painting, best drawing, and best sculpture. At noon WXNZ Radio is sponsoring a music competition with prizes for best performance by an individual, best group, and best original composition, followed by an open mic and media presentation. 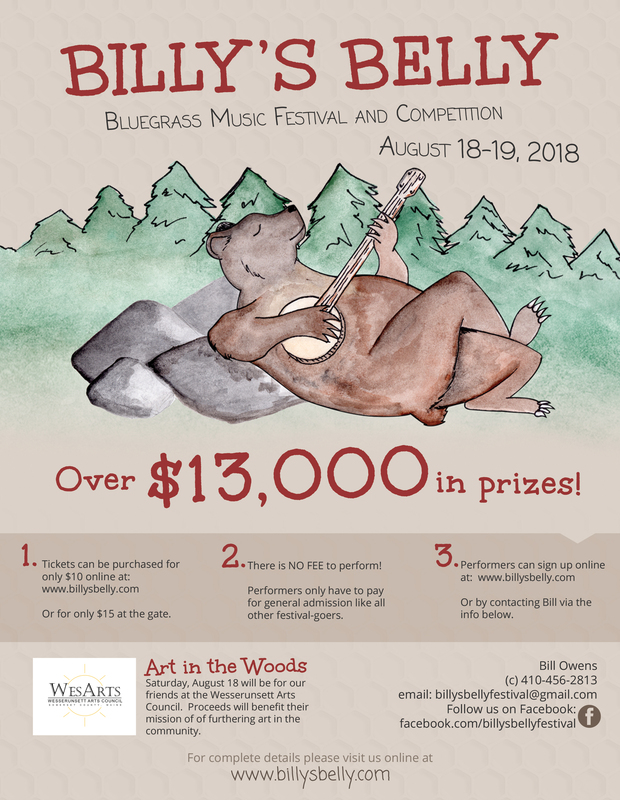 We regret to inform all festival goers that the Sunday portion of Billy's Belly and the music competition has been cancelled due to emergency health concerns of our founder and organizer. 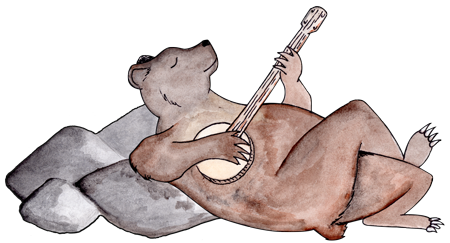 ** Saturday's festivities with Art in the Woods and the WXNZ music competition are still on! This year we have added another partner to our family. The Wesserunsett Arts Council! The events on Saturday, August 18 will be for our friends at the Wesserunsett Arts Council as ticket sales will benefit their organization’s mission. Tickets may be conveniently purchased here online by using the “Buy Now” link shown below. You may pay by credit card or with PayPal using this method. We will be able to accept cash, certified checks, or money orders at the gate if you are not able to purchase your tickets in advance. We will also be able to accept credit card payments at the gate for your convenience. Please print your PayPal email receipt to use as your official ticket at the gate. Our festival takes place on Clark Rd. in Anson Maine. Unfortunately many GPS devices do not locate our road properly and can’t be trusted to get you here accurately. Please follow the written directions below for the best way to find our festival! There will be major signage from all benchmark towns to our site. In Madison, follow 148 West (Main St.), go over the hill and across the Kennebec river. When you cross the bridge you will be in Anson. Turn right at end of bridge (look for signs) turns into US route 201A. Go apx 8 miles , then turn left onto route 234 (also known as the Anson Valley road). Go apx 6 miles and turn right on 4 Mile Square Road. Follow signs to Clark road and festival site. From Bingham ME. Take 201 to 201a in Solon ME. Approximately 16.4 miles to North Anson. Turn right on 234 (The Anson valley road). Go apx 12 miles and turn right on 4 Mile Square Road. Follow signs to Clark road and festival site. Take North Route 27 for Approximately 23.4 miles. Turn right onto route 234 (the Anson valley road). Go approximately 6 miles and turn left onto 4 Mile Square Road. Follow signs to Clark Road and festival site. that you can print for your own promotional use. There is no fee to compete you simply pay general admission. Our competition is open to all amateur and semi-professional musicians. All bands/ performers that are registered in the competition are welcome to sell their music related items for free such as tee shirts with their logo and personal CDs. No alcohol or drugs in stage area. Intoxicated persons shall be asked to leave. No physical altercations will be tolerated; both persons shall be asked to leave. Acoustical instruments only, yes that means bass also. Contestants will be registered on a first come first serve basis. There are limited slots, once filled, and registration will be closed. Each performer and or band will be judged by a panel of three judges. Moneys will be awarded at the close of competition on the same night. If you must leave before competition is completed and you have played your required set/sets, we will mail you your prize money. A band consists of 3 or more. Performers cannot play in other bands or groups, during the competition and once registered single performers cannot join with others. In other words “Dance with the one who brought Ya”. Each band, group or single performer will be asked to do two sets. The time for each set depends on the number of contestants. The least time for a set for a band would be 10 minutes x 2 and the longest set for a band would be no more than 15 minutes x2. A single performer will have 5 minutes x 2 and maximum of 7 minutes x 2. Points will be deducted for running over your time limit. Any performer that is too intoxicated to perform will be disqualified. Registrations will be accepted on day of festival providing there are still slots open, and again it will be first come first serve. 14. Have fun, learn new tricks and don’t feed the Gruffalo, and ahhh there is no rule number__ , well you know I can’t say the number, its bad luck.